Poseidon Water, MIT’s Amos Winter, and Oasys Water are developing crucial desalination projects and technologies. The world is a thirsty place. In many parched lands, including parts of the United States, desalination technologies are helping turn sea water and brackish ground water into clean water for drinking, bathing, and irrigation. These three Greater Boston companies are innovating improvements to boost the scale and improve the efficiency of a process that delivers one of life’s essential needs. No one will ever accuse Poseidon Water of thinking small. 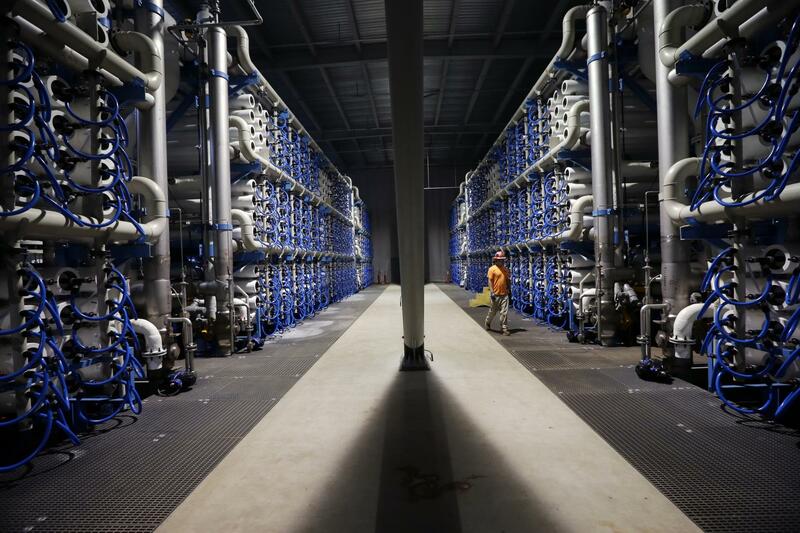 In 2015, the Boston company finished a three- year project building a $980 million desalination plant for San Diego County in Carlsbad, California, now the largest facility of its kind in the Western Hemisphere. The plant, which began operation last December, desalinates about 50 million gallons of sea water every day. The facility, owned and managed by Poseidon, now provides the county with about 10 percent of the fresh water it consumes and has become a focus of debate in parched California. 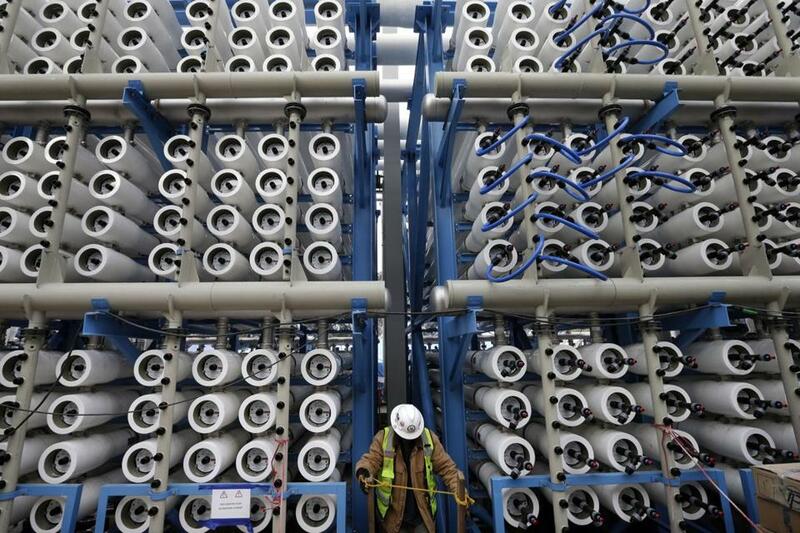 Are the ocean and huge desalination plants a good way to help the state solve its growing water crisis? In fact, Poseidon is in the final permitting phase for a similar size $1 billion plant in Huntington Beach, California, and other, smaller desalination projects are under discussion in the state. Some environmentalists had bitterly opposed the Carlsbad plant, arguing it would use too much electricity to operate and increase carbon dioxide emissions that contribute to climate change. Others have complained about its cost and the additional $5 a month water customers will be paying under a 30-year contract between Poseidon and San Diego County. But Poseidon Water chief executive Carlos Riva says the United States and the world will soon need to take dramatic action to avert potentially severe shortages of fresh water in the future. He believes that will require a combination of water conservation, new desalination plants, and other steps, such as water reclamation, i.e., cleaning sewer water. Amos Winter’ s method for purifying salty ground water won a $140,000 prize from the US government last year. But for Winter, a mechanical engineering professor at the Massachusetts Institute of Technology, the real victory will come when the new technology begins cranking out cheap, clean water all over the planet. Winter and his graduate student Natasha Wright used solar cells and lead-acid batteries to electrically remove salt ions from water. Now they’re working to make the system cheaper and more energy-efficient. He’s also investigating a battery-free version that would only produce fresh water when the sun shines, but in sufficient quantities to get a village through the day. There’s more the one way to help address the world’s need for drinkable water. Oasys Water Inc., an 8-year-old Boston company, has developed a new “forward osmosis” technology that turns some of the world’s most toxic industrial waste water into recycled fresh water. Traditional desalination technologies normally push contaminated water at tremendous pressure through membrane filters that catch and collect undesirable materials. But Oasys’s technology, originally developed at Yale University, effectively pulls “abused” water across a series of hair-thin membranes, made of polyamide materials, cleansing them in the process. Employing 60 people, Oasys says its desalination method reduces the cost and energy required to recover potable water from highly contaminated industrial waste water. Among the firm’s commercial customers are large water users such as power plants, mining companies, textile manufacturers, and oil and gas drilling companies, including North American hydraulic fracking firms. Last year, Oasys Water, which holds dozens of patents on its technologies, continued its aggressive push into new markets in Asia and the Middle East. Oasys isn’t profitable yet, but executives at the venture capital-financed company expect its revenues to hit $7 million to $10 million this year. They forecast the firm to be profitable within a few years. Written by Jay Fitzgerald and Hiawatha Bray of the Boston Globe and originally published on May 12, 2016. This article is part of the Boston Globe’s list of 2016 Game Changers.